Open source and cross platform: runs on Linux, Windows, Mac, all Raspberries, Odroids and possibly on other devices. Hardware accelearted and works with or without X11. It may even run on phones and tablets too. Full control over the UI: you can completely change everything that is on the screen, add or remove UI elements, menu screens, whatever. Want to make it look like Kodi? Steam? Any other launcher? No problem. You can even run your custom shader code. 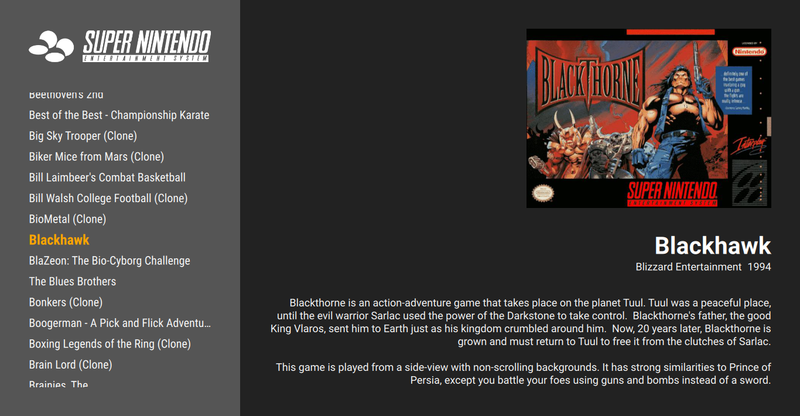 Features you'd expect: Gamepad support and config. Multiple aspect ratio support. Portable mode support. 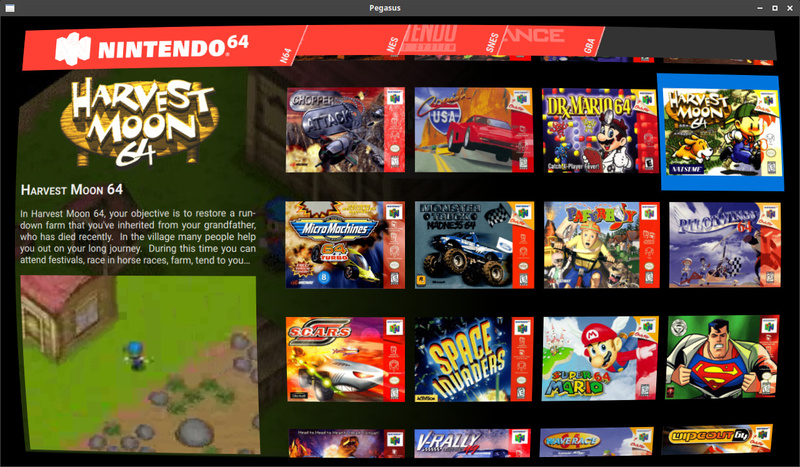 Live theme reload. Visible system informations. A clock in the corner. Pegasus uses QML/QtQuick2 for the UI (example code), C++ for the backend. Yes, it's more complex than an ES2 theme (since you can do more), but (in my opinion) easier than AttractMode/Hyperspin. Source code will be available after I finish implementing some core features, like a proper main menu and such. It'll be most likely under GPLv3 license. 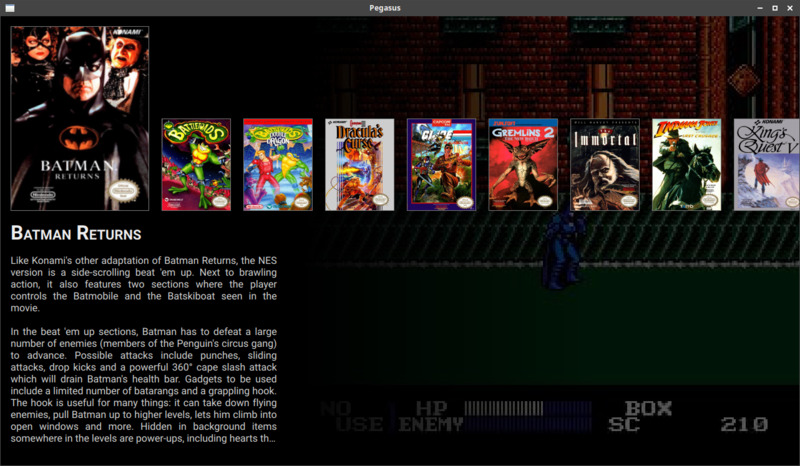 Pegasus is now available from the RetroPie setup menu, under the experimental packages. After the installation, you can either call /opt/retropie/supplementary/pegasus-fe/pegasus-fe manually, or edit /opt/retropie/configs/all/autostart.sh to launch Pegasus on boot (instead of eg. ES2). 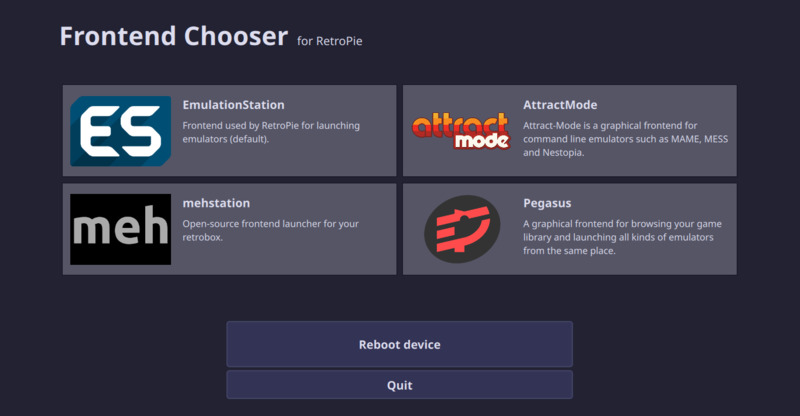 Alternatively, you can also use this tool to install Pegasus and set it to start on boot (the frontend chooser itself calls the RetroPie install script). Pegasus is cross-platfort and works on Windows and Android too. It auto-detects Steam games (with all the assets and metadata), and can be set to launch pretty much any other program or app. of Pegasus running on Android. Documentation is now available at http://pegasus-frontend.org, including build guides and theme customization tutorials. For questons about theme development and customization, you can also use this topic. Is Grid View the only option or can you do a normal gamelist like current ES? 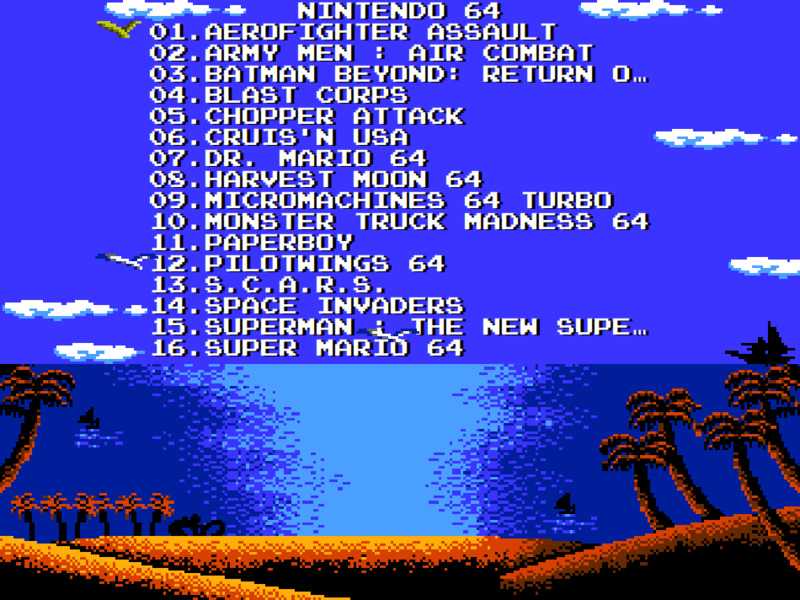 How does the grid handle different box sizes (eg: if you have SNES and Famicom boxes together)? How many <image> meta tags are there? Is it just <image>, <video> and <marquee> like current ES, or do you have them separated into <boxart>, <fanart>, <logo>, <screenshot>, etc? Also, it's always nice to find people making use of the Toolkit. From what I've heard, you can make the front end look any way you want. Add menus, add animation, full layering support. Shader support (like CRT-Pi and such). You should also be able to access Wifi setup and some other Raspberry Pi settings from the menus of the front end. this looks and sounds, pretty promising! really looking forward on how this will turn out, great going! At the moment, you have to manually set the width/height of the cells, which you can fine tune by adding some logic; for example in the video I've set the number of columns to 5 when the current platform is NES. On the long term, I'd like to make the sizes of the cells dynamic, so you could just set a max width or height and it'd align properly. 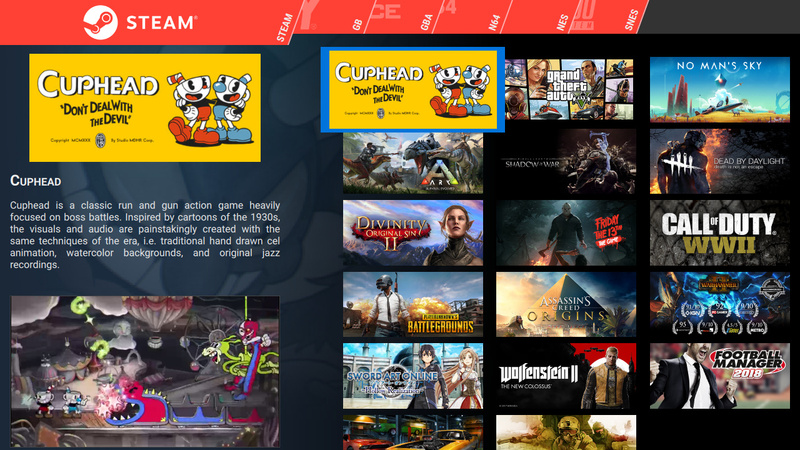 Currently front/back/spine/full 2D boxart, cartridge/disc image, logo, Steam grid image, fanart, multiple screenshots and videos. I can add more if you wish. @nitrogen_widget it looks like both the regular and the pro CHIP uses Mali GPUs, like the Odroids, so yes, it should run fine and fast. I would love to to see the possibility to merge different systems into one. I have only a handful of Roms for Game Gear, Master System, Mega Drive and Sega32x and really wish I could merge them into just Sega. 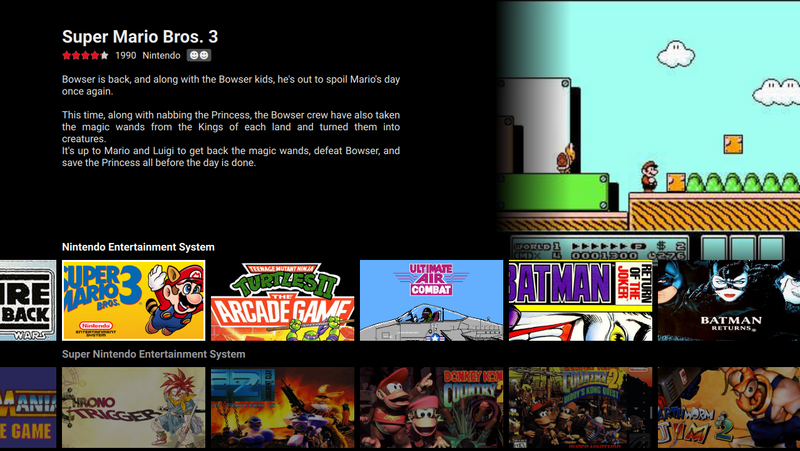 Since this seems so highly customizable, I would probably would use only one System and try to recreate a Kodi Skin. what language will the Theming/Skinning/Layouts be in? @EctoOne this sound more like something you would set in a gamelist file; I could add support for something like a <systemGroup> tag, where you'd put <system>s you want to handle together. Or a special system attribute, if we want to maintain strict ES2 compatibility. thank you, whats it like to learn? i have very limited coding knoledge, can pick things up pretty easily tho, can anyone recommend any reading material? @fluffypillow nice one :-) Look forward to trying it. I got attractmode compiled on my chip but it was dog slow and i couldn't get sfml with accelleration to compile. emulationstation was a little laggy on chip. @InsecureSpike well QML itself can be used for a lot of things, so it can look very complex at first. It can even be used for writing mobile games or web browsers, but fortunately for theming you won't have get familiar with all the components. In my opinion, the somewhat harder part is setting up the scrollable/moving elements (like a grid or a cover list) the way you want. After that, styling the elements is easy. I'm going to write some tutorials when it gets released, in the meantime you might find this guide useful. I'm really impressed. I've tried Attract Mode on my Pi, and it's kinda hard to use, at least for me, so I'm ready to see a new frontend. One thing though: Will it be an easy setup for the Pi? I don't want to go through the hassle of changing so much code and stuff. @itsnitro in practice, a Pi release should "just work". The only problem is that Debian/Raspbian currently uses an outdated, 3 years old version of Qt, from which a bunch of features and optimizations are missing. As such, I'll include the required Qt libs with the releases, and also host the build tools and libraries too if you want to build on the board or cross compile. @hurricanefan Heh, yeah... It just kind of grew. It's not a complete list, as I'm sure the "Collection" section will continue to grow as I go through more of my Gamelists. Is Synth Wave Theme still in development? I love this theme sooooooo much. I'm a proper 80's boy! Is there a way to extract the music from this image please Coin Junkie? I have FTP'd into the image but can't see the audio files? Thanks for the great Theme! @Hex Thanks for the info!